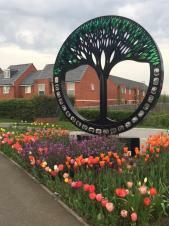 We've made a start on our bid for this year's Bloom competition by planting up the Timken Art on the Main Road. 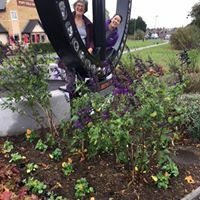 Our lovely volunteers, Jane and Claire, braved gale force winds to put in 100 pansies in the Timken colours of black and orange. 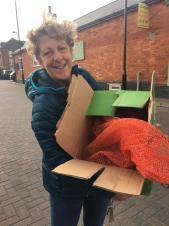 Our Youth Manager, Jenny, ably assisted by another lovely volunteer, Issy, planted a sack of bulbs donated by Howdens Joinery around the village. 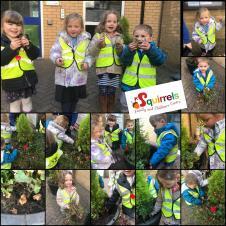 The lovely little people at Squirrels childcare also planted bulbs in the tubs outside Duston Community Centre. 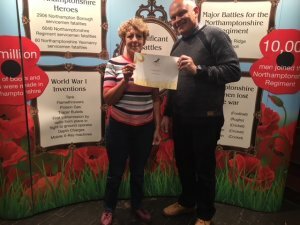 Duston Parish Council will also be entering and you can be a part of it! This is a great opportunity for everyone to get involved to make where we live even better. 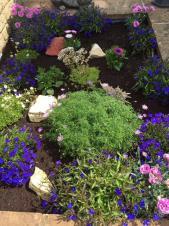 Whether that is litter picking, having a community tidy up, showcasing your own front garden or getting involved in one of Duston Parish Council's planting initiatives...it all counts. 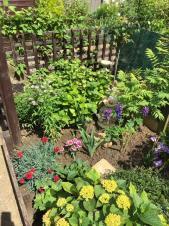 We have already got several groups and individuals on board doing a variety of things from making bird boxes and bug houses to knitting poppies for our cascade, which will also count, to painting pebbles for Love on the Rocks, Duston. What's more, Bloom is not just for Christmas! 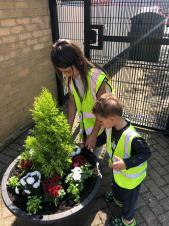 We are committed to continuing to make our village even lovelier and will be holding regular community planting days and litter picks throughout the coming months. 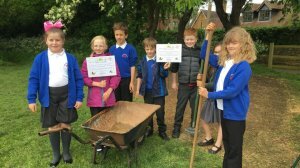 We were delighted that children from year 4 at Hopping Hill School joined us to sow wild flower seeds on the St Luke's Field. 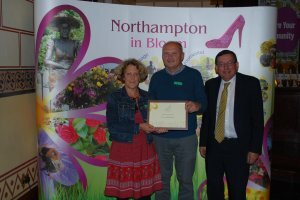 This was a great example of community engagement and helped Duston Parish Council kick off our Northampton in Bloom bid. 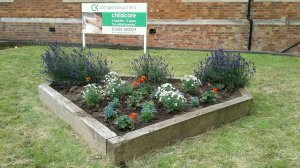 Children from Squirrels Childcare made a lovely job of the barrel planters at Duston Community Centre. 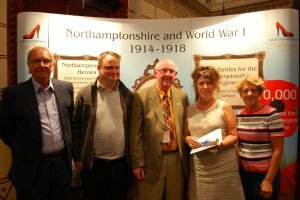 They chose red, white and blue to fit in with the WW1 Centenary theme as part of our bid for Northampton in Bloom 2018. 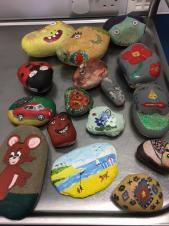 Thank you to the wonderful members of Duston Art Group who have been painting nature themed rocks as part of our Northampton in Bloom bid. They had great fun painting them in the spirit of the 'Love on the Rocks Duston' craze that is generating hours of free, outdoor fun for the whole community. 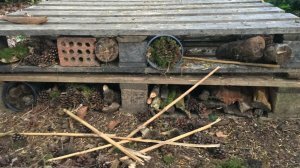 Look at this fantastic, super-sized bug habitat made by our young people. 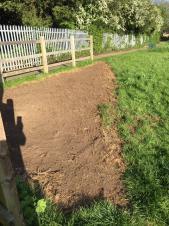 The critters around Duston will have a great time! Please visit our Café Bar at Pendle Road where you can enjoy a coffee and look at a display of our Bloom 2018 bid.